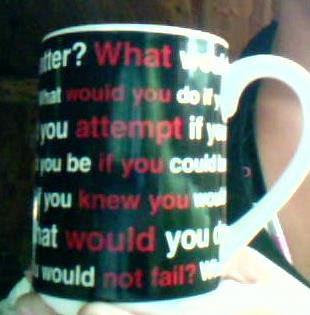 What would you attempt if you knew you wouldnt fail??? I just got done watching the movie “The curious case of Benjamin button” A peculiar movie. It was really good just kinda sad. But it got me thinking about my life. This guy was born with iniquities and sickness but he kept on pushing forward. He was different from the rest of the people. He was set apart. He was not like everyone around him but he was special to the people around him. He set out to do things he never knew he could do and he sometimes failed and sometimes succeeded but the most important thing is out of all those things that he failed at and things that he greatly succeeded at he took the RISK!!! He most likely was frightened and sometimes feeling out of place but he still took that step. He found life. He was in a dark place but eventually found life because he kept on keeping on. Although the ending was sad and made me think of what the things I would rather not think about it made me ask myself “What would I attempt if I knew I would not fail?? ?” He didn’t know he wouldn’t fail but just imagine what he would’ve done knowing he wouldn’t fail at whatever he was about to attempt??? I don’t have much more than that to ask you. What would YOU attempt if YOU knew YOU would not fail?? Maybe tonight will be a night where you and I can go back to our heart and find that place we have maybe put on lockdown so the fear of failure or the fear of your heart being broke again and open it up to find that thing you’ve always wanted to attempt. I am in a thoughtful mood tonight so this post isn’t long and maybe people will read it…maybe they won’t but for me I’m going to ask myself what would I attempt if I know I would not fail? What would you do if you knew how much people believed in you?? What would you do if money didn’t matter?? What would you be if you could be anything you wanted to be?? By the way, I want people who read this know I am not saying life would be easier if we didn't fail at anything. My main Idea when writing this was how FAITH comes into the picture not that we would go through life with no problems but that we would loose the fear that sometimes paralyzes us. I think life would be pretty boring if I knew I couldn't fail at anything I wanted to do. Of course it would be fun at first to go to the moon, buy whatever I wanted, go wherever i wanted... but their can be no joy without pain. No rest without struggle. No success without failure. I think God set up this life with that in mind. He's our father and LOVES us more then anything. But for some reason He allows us to fail from time to time and I can't help but to believe that it is what s best for us, because He does in fact love us. I think what makes people great is the knowledge that they could fail (and in some cases lose their very lives), but yet they attempt what is in their heart in spite of that knowledge. If I knew I couldn't fail, I would live this life unfulfilled and without trusting in my heavenly Father who loves me enough to let me fail, so He can rescue me. Good points! I think this is where our faith comes into play. No one knows their future and so likewise, no one knows if they are going to fail at something or going to pass with flying colors. Its that step of faith that is sooo pivotal in a persons life. I know for me, the things I have failed at have allowed me to grow and learn from those mistakes. Its made me who I am!!! VERY inspiring blog. There are no other words for it. I was praying this morning for God to being to guide me to be the woman of God that He desires for me to be. So many things will run through my head as to what I "should" do- being more giving, loving, caring, etc. But now these things are what I "could" do with HIM by my side every step of the way. The question "what would you attempt if you knew you would not fail" is one way of coming to terms with purpose. Within our innermost beings we all have "dreams" or at least inklings of what we were put here on earth to do. The would not fail portion of the question puts us in a frame of mind to step outside of our self-imposed walls. essentiel questions and great post! My answer is simple: I'll try to live everyday like it was the last day of my life and I'll try to accomplish bigger things for myself and the humanity.